† The level 36-45 version of the blade has 25 points of Absorb Stamina, instead of the 20 points that was probably intended. This issue has been addressed by version 2.0.0 of the Unofficial Skyrim Patch; the Absorb Stamina inconsistency is corrected. The highest level version of the blade (000f6527) cannot be tempered. 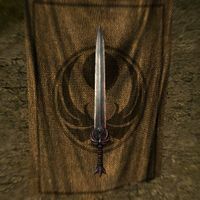 Mod Notes: TemperWeaponNightingaleBlade05 incorrectly requires NightingaleBlade04 instead of NightingaleBlade05. This bug is fixed by version 1.0.0 of the Unofficial Skyrim Patch. The blade is not affected by any smithing perks.